Giuseppe Cocco Linguine pasta is made using traditional methods. It is dried slowly to give a porous texture that is similar to home-made pasta. Using a handful of top-quality ingredients, such as this pasta, you can create something special. 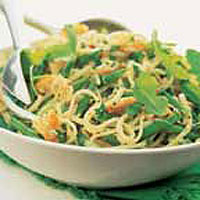 Mix the linguine with salmon flakes and green beans in a warm buttery sauce for a simple mid-week meal. Bring a large pan of water to the boil. Add the pasta and return to the boil. Stir well and cook for 5 minutes, then add the beans. Quickly return the water to the boil and cook for a further 6 minutes, stirring occasionally, until the pasta is just tender. Meanwhile, melt the butter in a small pan, add the salmon and gently warm through. Add the lemon juice, season with salt and freshly ground black pepper and keep warm. Drain the pasta and beans and return them to the pan. Add the salmon, buttery juices and the parsley, then toss everything together lightly. Serve immediately in warm bowls with a rocket salad. Replace the hot smoked salmon with a 170g can white meat crab, drained well. Try serving Waitrose Raspberry Brûlée Cheesecake to follow.